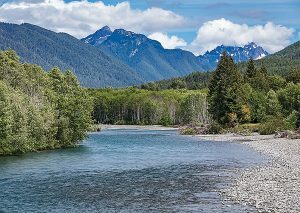 News and views of a Washington State environmental consulting and engineering firm. Well, it December once again, and that means the new Robinson Noble calendars will soon be in the mail. If you receive a calendar from us, you know that I take all the photos for the calendar. This gives our calendar a special niche, separating it from other calendars that are given out this time of year. 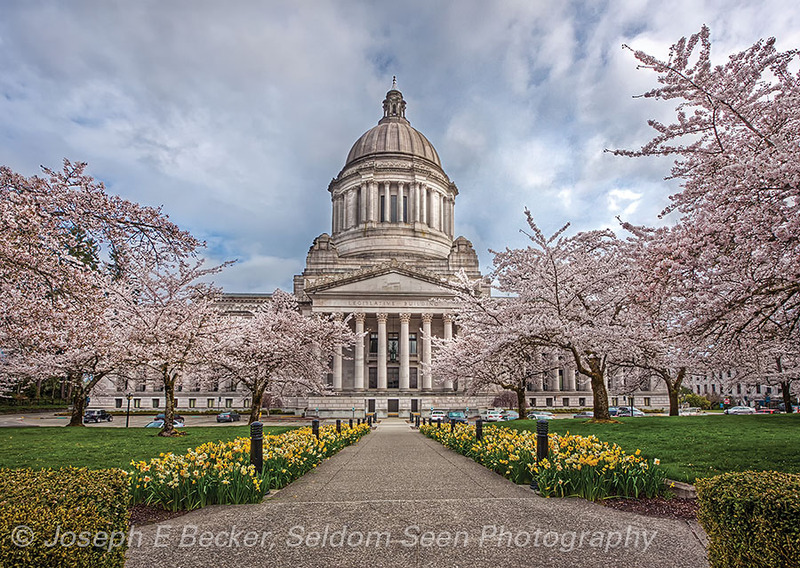 While we could populate our calendar with images of drill rigs and backhoes, we prefer Pacific Northwest scenic images so that our clients might be more tempted to hang the calendar on their walls and remember us throughout the year. Besides, I prefer taking scenic subjects to backhoes. As part of the annual calendar process, I present the upcoming twelve images in a blog post with “the story behind the images.” Below are the stories for the 2017 images. I’ve mentioned in previous years, there is an unwritten rule that January and December calendar images need to contain snow. As I am not a big fan of winter, I don’t take a lot of photos of snowy conditions. So this year, on February 1st, I made sure I went on a snowshoeing trip with the goal of getting one or two calendar-worthy shots. And this trip was well worth it, turning out to be a goldmine for potential calendar photos. 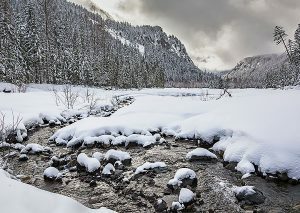 I went with a friend to Mount Rainier National Park without a specific destination other than to get out on our snowshoes and take some pictures. Halfway up to Paradise, we stopped where the road crosses the Nisqually River. We took a few pictures from the bridge looking down onto the river valley. Here the river forms a braided channel across the valley floor. With snow, this boulder strewn floodplain becomes a beckoning white flat land, perfect for snowshoeing. So we walked down into the valley. We couldn’t hike more than about a mile without attempting a river crossing, which we decided against, but the scenery was excellent and I took a multitude of shots of the braided river channels crossing this winter wonderland, including the shot we used for January. Recently, I published a book about touring and photographing Seattle (available from me here or through most booksellers, including Amazon). In the book, I also covered the Winslow area of Bainbridge Island. When I was preparing the book, I didn’t have any decent photographs of Winslow, so one February day my wife, Tanya, and I took our dog on a ferry ride from downtown Seattle to Bainbridge Island. Our dog is a Newfoundland, weighing in at 145 pounds; she was a great hit with the other ferry passengers. When we reached Bainbridge, we walked down along the Winslow waterfront and then back through town. 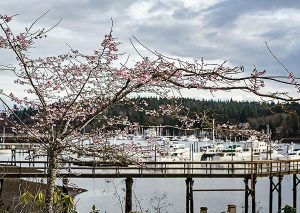 Though February, there was a hint that spring was coming soon, including this cherry tree by the harbor. 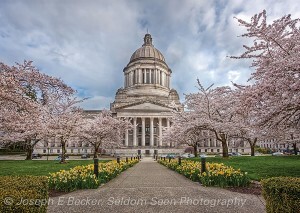 I like the image for the delicate cherry blossoms just starting to appear extending a hope of warmer days to come. That trip turned out to be very lucrative. On our walk, I also took a photograph of a stack of colorful kayaks. Earlier this year, I sold a license of that image for several thousand dollars to an art dealer in San Francisco for use at a hotel in Florida. Fishing boats are a favorite subject of mine. 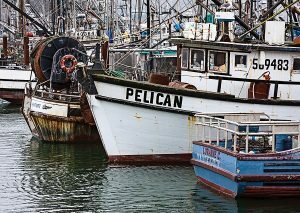 Luckily there are lots of good places in the Pacific Northwest with good working-boat harbors. One of the best is in Newport, Oregon. One thing nice about photographing fishing boats, you can take good photos in almost any kind of weather. That was the case here. The morning I took this shot, it was cold with low clouds and a light rain – not the type of weather to take nice scenic shots of the Oregon coast. But in Newport harbor, plenty of good photographic opportunities could be found. April’s photo is also on the coast, but up in Washington. Every April I participate in the arts show at Ocean Shores. The day this photo was taken, I was in Ocean Shores with my son, Brooks (who took the “monkey on my back” photo in the calendar), to drop off prints for the art show. After dropping them off, we didn’t want to drive back home right away, so we drove up the coast looking for a beach to walk on. We went to the beach at Moclips, but I didn’t find much photographic inspiration there. Driving back south again, we stopped at Griffiths-Priday Ocean State Park just outside the town of Copalis Beach. I had never been to this state park before, and as it was near sunset, was looking for a good subject. The beach here, like most the beaches north of Grays Harbor and south of Point Grenville, is broad and sandy. In fact, the beach at Griffiths-Priday Ocean State Park is even broader than most. While I like walking on such wide, sandy beaches, I find it difficult to get scenic shots on them. But the interesting thing at Griffiths-Priday Ocean State Park is that is where the Copalis River enters the Pacific Ocean. And the river doesn’t just run straight into the ocean, but instead, just about 1,500 feet from the beach, the river makes a 90-degree bend from flowing east to north, almost paralleling the shoreline for a mile or more through the state park until it finally turns westward and flows into the ocean. Closer to the shoreline, a smaller, though still sizable, unnamed stream follows the same pattern, running north paralleling the beach. Instead of turning directly west, however, this stream eventually bends almost 180 degrees back to the south before then turning 90 degrees west to the ocean. The state park parking lot is between the stream and the river. From the parking lot, you cannot get quickly to the beach unless you want to wade across the stream, which I had no desire to do on a cold early April evening. A trail from the parking lot runs through old dunes, paralleling the stream, and slightly above the beach. The April photo was taken along that trail, where I positioned myself so the setting sun was above a smaller branch of the stream (that was following the same pattern of flowing north before turning south and west). The curve in the stream was exactly the type of feature I was looking for to make a “sandy-beach” shot more visually interesting. 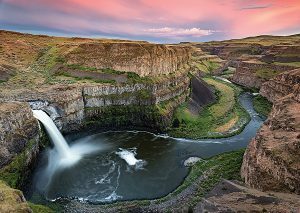 May’s photo is of Palouse Falls. Last year I went there for several days with a fellow photographer specifically to take images of Palouse Falls at night with the Milky Way. We were there two nights. The first night, I got a good shot with the falls and the stars (which you can see here). To take the image, my friend lit up the falls with a giant flashlight (6 million candlepower) from the main viewpoint area, while I tripped the shutters on our cameras from a spot close to where this calendar photo was taken. I was very happy with the result. But you will not see it on our calendar anytime soon because I didn’t get one in horizontal format. The second day I hoped for more clear skies to try again, this time focusing on horizontal compositions. But as the day grew, the skies became cloudy. No Milky Way shots that night. However, all was not lost, the clouds gave us nice sunset shots, like the one used on the calendar. Not a bad consolation prize. Last June, I took a day trip to Ruby Beach in Olympic National Park. It was kind of misty at the beach; not the best photography conditions. So we decided to go into the Hoh rain forest and come back to the beach at sunset for hopefully less low clouds. The plan actually worked, the low clouds were mostly gone at sunset. Unfortunately the sunset itself wasn’t very good. This photo was taken on our drive into the Hoh. Unless you live on the coast, you don’t see the Olympic Mountains from the west very often. As we drove past this spot where you could see both the mountains and the Hoh River, I knew I wanted to capture the mountains from this angle, so we turned the car around and pulled over. There is nothing special to this shot; it is one anyone could take. I shot from the roadside for a few minutes, and we continued on to the rain forest. This quick shot from the roadside was one of the better shots of the day. 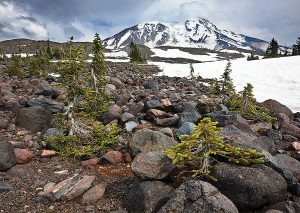 This image of Mount Adams was taken on a hike Tanya and I took with our dog in 2010. It was a partly cloudy day, though the hike was mostly in the sun. You couldn’t see the mountain until near the end of the hike when the trail left the forest. The clouds seemed to be rolling over the top of the mountain. I liked the look and went searching for a nice foreground. We were near the tree line, and I found this area of miniature trees in a boulder field. I really liked the look of these trees and made a lot of photographs here. The tree in the foreground is only about 18 inches tall, but I’m sure it is many years old. After we got back to the car, we drove to Takalakh Lake to eat a picnic dinner and for me to take some photos of the lake and Mount Adams at sunset. Photographically, the trip was very successful. One of the images from the lake was on the calendar in 2012. I’ve always liked this present image very much and hoped we would put it on the calendar someday; it finally made it for 2017. 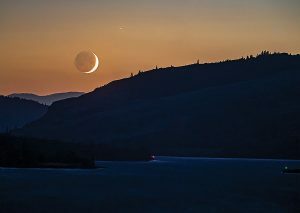 The image for August was taken from Lyle, Washington – a small town in the Columbia River Gorge. Tanya and I were there for a family reunion. We were staying at an Airbnb with a view down the river. I have an app that shows where the moon (and sun) will rise and set, and using it, I knew a crescent moon would be setting straight down the gorge the night of the family reunion. So we left a bit early so I could take this shot, which I took from the deck of our room. Technically, this was a very difficult photograph to make. I made the shot considerably after sunset, so it was quite dark. Even so, the contrast been the sky and river was large, and it was difficult to capture detail in both with one exposure. Because of the light conditions, a long exposure time was needed. However, long exposures caused the moon and star (actually probably a planet, most likely Venus) to be blurred (due to the earth’s rotation). To make matters worse, the wind was blowing hard, as it often does in the gorge. For this image, I ended combining a 2-second exposure of the sky and 10-second exposure of the land and river into a single image (10 seconds was long enough to cause motion blur on the moon and planet). Because it is so dark, the image is also technically difficult to print. And, unfortunately, the image did not print well in the calendar, with the land and river being much too dark. I was concerned about that when we decided to use this image, but the proof from the printer came back looking good. However, something happened when the actual calendar print run was made, and I am not happy with the results. The image presented here in the blog is much more true to what I saw and what the image on the calendar should look like. I love shooting in the Palouse. Spring brings wonderful greens, and late summer brings delightful golden yellows. Last year, on a trip to Spokane to see my Dad, we left Tacoma in early morning so we could spend the afternoon driving the backroads of the Palouse before heading up to Spokane for the evening. The weather was great for photography, mostly sunny, but with lots of interesting clouds. 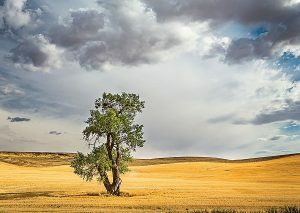 I love to just drive on random back roads through the Palouse looking for interesting subjects. And if I have a lot of time, I will do just that. But in this case, we only had a few hours in the afternoon, so I went with Plan B – using a photographer’s map. There are two photographer’s maps of the Palouse – one is free from the Pullman Chamber of Commerce and the other costs $25 from a photographer named Teri Lou Dantzler. Both show locations of barns, lone trees, viewpoints, windmills, and more. Though different in format, both are nearly identical in content, and Teri Lou claims the Chamber of Commerce copied her map. I have both maps, and I think Teri Lou has a case. Even when using the maps, you cannot tell if the light will be good for any particular shot; some subjects photograph better in morning light and some better in evening. Plus, some of the barns, other structures, and lone trees on the maps have fallen down. So, even with the maps, you still need to search for good subjects. However, when the maps directed us to this tree, I know I had a winner. I hope you agree. As with the unwritten “snow” rule for December and January, it seems there is an unwritten “autumn color” rule for October. This is a harder rule to follow, because the colorful autumn foliage season is short and colorful autumn foliage is less common in the Pacific Northwest than other parts of the country. In search of fall colors, Tanya and I took a trip in October 2015 to Silverton, Oregon, which is about 10 miles north of Silver Falls State Park. I’ve seen beautiful photographs of Silver Falls State Park for years and decided I had to go. I was not disappointed. Though the water falls in the park had small flows because of the time of year, the trees were beautiful, and I came home with many wonderful images. In addition to visiting the state park, I made a big looping drive through the central Oregon Cascades and found some other colorful spots, and one of these images may show up in a future Robinson Noble calendar. The featured shot here is of Middle North Falls, a several mile hike into the park along the Trail of Ten Falls. 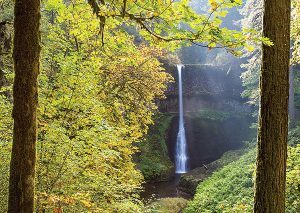 Considered the “crown jewel” of Oregon State Parks, the park covers over 9,000 acres. Hopefully I can get back again soon in the spring time when the falls will have a higher flow. November is always a tough month for me to do a lot of photography. Normally, with work and chores at home, it is hard for me to find time to take pictures. But with a short month and family holiday obligations, November is especially hard. Also the weather is usually rainy and cold; the lowlands just look sadly wet, and the highlands don’t have much snow yet. Several years ago, Tanya and I made a weekend trip to Port Townsend with friends. According to Tanya, this was not to be a “photography trip” but a “friend trip.” In other words, I could take my camera, but photography was not to control the agenda. During the weekend, the four of us were strolling in downtown Port Townsend after lunch, doing a little shopping. 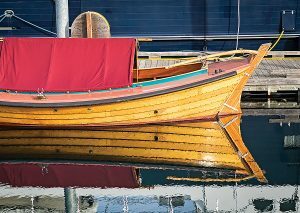 I snuck off and went up to the harbor with my camera where I captured this image of a wooden boat. I was especially taken by the reflection. After this and a few other quick shots, I returned to Water Street and found Tanya and our friends. They barely know I had been gone. As I’ve mentioned – snow is required for a December image. This photograph was taken at Hurricane Ridge in Olympic National Park and was actually shot in January. The snow pack was very low that winter. 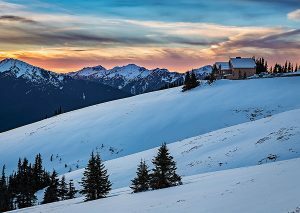 We had gone up to Hurricane Ridge to go snowshoeing, and after an afternoon tromping around in the snow, we stayed for sunset. The road closes at dusk, so I stayed near the parking lot in case a ranger came and told us to leave. Sure enough, just as I was starting to pack up my gear, the ranger stopped and shooed us out. It was not the first time I’ve been asked to leave by a park ranger and probably not the last. Any of these images are for sale as fine-art prints. 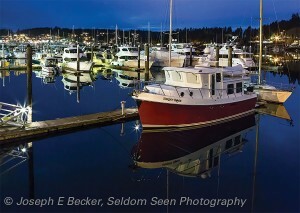 If you enjoy my photography, please visit my blog at joebeckerphoto.wordpress.com or my website at seldomseenphoto.com. I can be contacted at either, or by leaving a comment here. The new Robinson Noble calendars were mailed on December 14th, so you may have already received one. It has become my tradition with each new edition of the Robinson Noble calendar to present the story behind the images here in the blog. So here’s the images for 2016. As I’ve mentioned in the past, there seems to be an unwritten rule that January and December calendar pictures in the northern hemisphere need to have snow visible in them. This presents a problem for me, as I am not a winter lover. But I do own a pair of snowshoes, and last January, I convinced my wife, Tanya, to have an outing in the snow. I bought a Sno-Park season pass (figuring I’d be trying for more snow photography later in the winter and spring) and we headed out. Now, as you might remember, there wasn’t much snow in the Cascades last January. Further, our outing looked doomed from the start. It was cloudy in Tacoma and raining horribly at Snoqualmie Pass. Coming down out of the pass, the weather cleared a bit, but there was no snow. We drove up to Blewett Pass, and finally, right at the top, we found both snow and a little but of sunny weather. We hiked about a mile or so west of the pass and found this wonderful view of the Stuart Range wrapped in clouds. I would have like to go further, but it was already late in the day and our dog was matted with large snowballs (she probably had 20 pounds of snow matted into her fur, which I had to break out back at the car). But it was a successful trip – calendar photo with snow captured. I love the image and am glad we went. However, buying the season pass was a mistake. There was so little snow last winter that we never did go find any other significant snow the rest of the season. No snow, no place to go. That seemed like last February for me. I ended up barely getting the camera out last February. 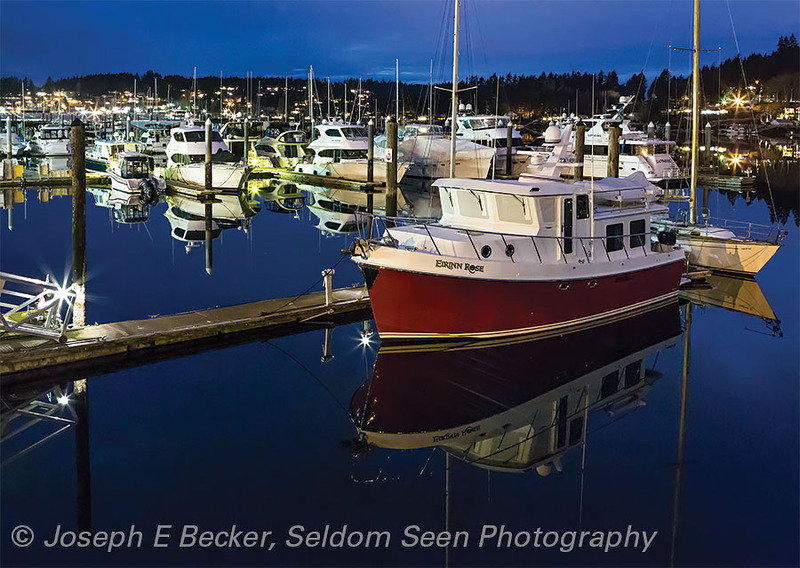 However, one night I had a late afternoon appointment in Gig Harbor followed by my regular Gig Harbor photo club (Sound Exposure Photo Club) meeting later that night. So I took the camera along to play with between the appointment and meeting. This shot was taken Maritime Pier next to the Tides Tavern. I loved the look of the Eirinn Rose reflected in the calm water of the harbor as the sky darkened. It was quite dark by the time I found the scene, so it demanded a long exposure. Normally, when shooting at night, I will take a test shot with a high ISO setting, allowing for a faster shutter speed. Then take the “real” shot with a low ISO and a long shutter speed. In this case, the shutter speed for the “real” shot was several minutes long (compared to several seconds for the test image). In between the test and real images, two men came down the gangplank and got into the Eirinn Rose. No problem, I let them climb aboard, waited a minute or so while the boat settled, and took the shot. It looked great on the LCD screen on the back of the camera. However, when I got home and zoomed it up on the computer, I found the Eirinn Rose was fuzzy while everything else was perfectly in focus. Apparently, the men inside the boat were causing the boat to rock ever so slightly, not visible to my naked eye, but visible to the camera. Luckily, the “test” shot was good, and with a little digital magic, I was able to minimize the digital noise that accompanies high ISO shots enough that it could be used for the calendar. Several years ago, Tanya and I were getting a bit of spring fever and wanted to get out and do a hike in March. Not much of the high country is open in March, but trails near Puget Sound are. We gathered up the dog and headed up to Whidbey Island to Ebey’s Landing National Historical Reserve. 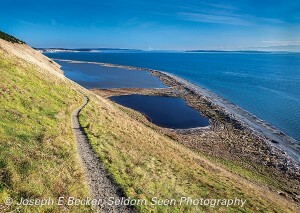 The loop hike (5.6 miles long) at Ebey’s Landing is a wonderful hike in the spring, or actually anytime of the year. The trailhead we used starts at the Coupeville cemetery, runs out to the edge of the bluff, follows the top of the bluff, drops down to the beach (where this image was taken), follows the beach, and the climbs back up the bluff. The views of Puget Sound are spectacular, as is the view of the Olympic Mountains (looking the opposite way from which this image was taken). I shot this image in 2011, but first started thinking about it three years earlier (as I explained on my photo blog). When I first thought of the image, it was too late in the spring and the cherry trees were already past their prime. Two years later, conditions were right and I had time on a Saturday morning to run down to Olympia. I wanted to take the image on a weekend to minimize the number of people milling about. Still, conditions were that great. The sky was very bright and the foreground dark. I took a series of three shots with different exposures and combined them into a high dynamic range (HDR) image. 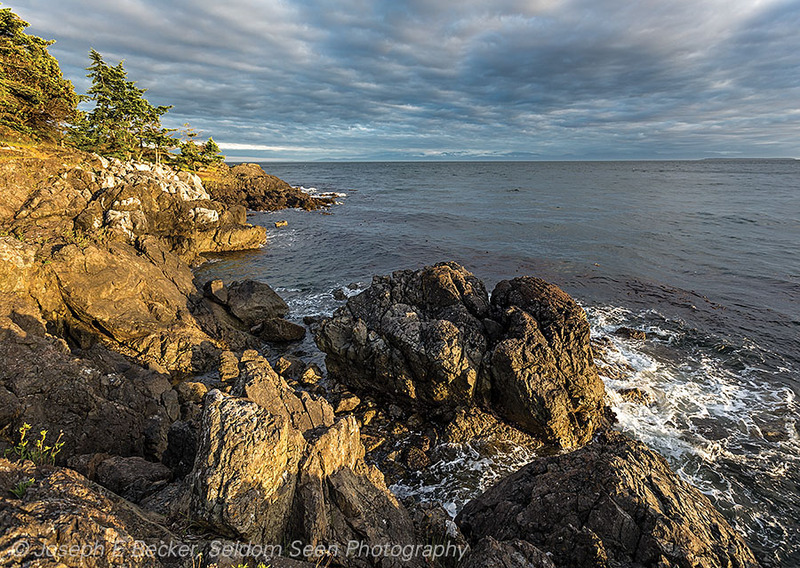 HDR allows a photographer to reduce contrast and show detail in both light and dark areas. Back in 2011, it took a special computer program to produce HDR images. Today, many cameras will do it on the fly. Three years in the making – I think it was worth the wait. The Oregon coast is one of my favorite places for photography in the Pacific Northwest. I try to get down there every few years. This shot is from 2012, when Tanya and I took a spring camping trip to the coast. We camped south of Cannon Beach, but came up to Ecola State Park for a walk on the beach and to take evening and sunset shots from Ecola Point south toward Cannon Beach. The sunset was fine, nothing spectacular, and I liked this shot prior to sunset better than the ones I took later when the sun was setting. The sunset was special in another way. 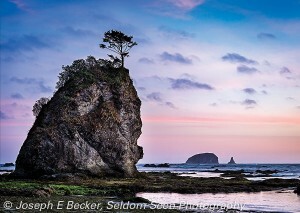 Offshore from Ecola is the Tillamook Rock Light – a now deactivated lighthouse on top of a small rocky island. 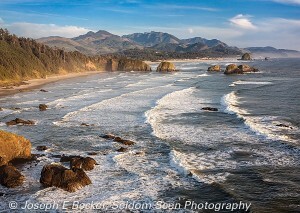 The day we were at Ecola, the sun set very close to the Tillamook Light, but that is a photo for another calendar. 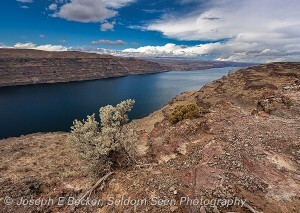 June is a prime time to visit eastern Washington. Though I grew up in Spokane, I had never photographed much in the Palouse region of eastern Washington until several years ago. We made a trip over in June of 2012 specifically for photography, spending a couple of days photographing the Palouse and a couple of days photographing Spokane (for an assignment I had with American Bungalow Magazine). Several previous images from this trip have been featured in past Robinson Noble calendars. This particular image is of the Dahmen Barn in Uniontown. 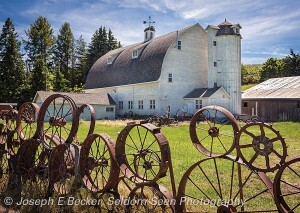 I’m not the only photographer who likes this barn; it’s been photographed so often that it is becoming an icon of the Palouse region (a Google image search for “Palouse barn” will turn up many photographs of it). The barn is no longer used for agriculture, but is now a studio for numerous artists and is officially known as the Artisans at the Dahmen Barn. While Tanya visited the artists in the barn, I took time to walk around the property and photograph it from various angles. I particularly liked this view through the wagon wheel fence that surrounds the propery. My father’s family settled near Uniontown (my great-grandfather and great-uncle were early settlers in the town of Colton, just three miles west of Uniontown), and I still have a lot of relatives in the region. I have an uncle and cousins with the last name of Dahmen and have wondered how they may be related to this barn. Last July I made a backpacking trip along the Olympic National Park coast with my brother and his grandson, from Shi Shi Beach to Rialto Beach – a distance of 37 miles. One reason we selected this hike was our assumption that without a lot of elevation gain, the hike would be relatively easy. How hard can it be walking on a beach? Well, I had my last physical therapy session today for my knees due to pain developed during that easy hike. But perhaps that says more about my age than the hike? We were hiking for six days, which provided plenty of opportunity for photography. This scene was captured after sunset at Kayostia Beach, near the Norwegian Memorial. The sea stacks along the coast provided many photographic opportunities and were a favorite subject of mine on the trip. 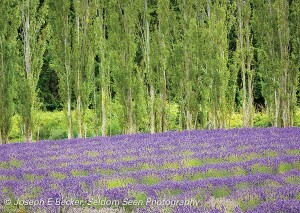 One to the highlights of the Olympic Peninsula in summer is the lavender fields near Sequim. I’ve made several trips up to the area to photograph the fields. This shot is from a trip in 2011. The best shots are usually made in July, immediately before the Sequim Lavender Festival because farmers start harvesting the fields after the festival to make lavender oil and other products. This shot was taken in August, and luckily for me, this particular field had not yet been cut. Growing up in Spokane and still having relatives there, I’ve driven by Vantage, Washington hundreds of times over the years but had never done much photography there. One reason is that if driving from the Puget Sound area to Spokane, or visa versa, you past by Vantage in the middle of the day, which is one of the worst times of day for scenic photography. However, on one trip home from visiting my folks in 2010, Tanya and I stopped outside Vantage at a viewpoint overlooking the Columbia River. The sun was behind a cloud, removing the harsh, contrasting light of mid-day. I took the opportunity to snap this image of the river. Autumn color can sometimes be a bit hard to find in the Pacific Northwest. 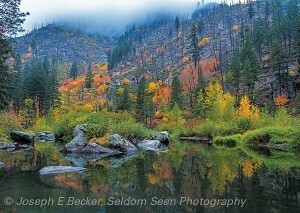 One of the best spots, however, is the mountain valleys near Leavenworth, Washington. One October weekend in 2014, Tanya and I decided to drive up to Leavenworth to see the colors. We picked up Tanya’s mother for the ride and headed out. The quickest route to Leavenworth from Tacoma is over Snoqualmie and Blewett Passes, so we came into Leavenworth from the east. It normally takes about 2.5 hours to drive to Leavenworth from Tacoma. However, the day we decided to go, Octoberfest was in full swing in Leavenworth. It took us about 2 hours and 25 minutes to drive to within a mile of town, then about 45 minutes to drive into the town and find a parking spot. Then even longer to find a restaurant with an open table for lunch. It didn’t leave that much time for photography. I left Tanya and her mother in town to check out the festival and headed up Icicle Creek to shoot. Later I picked up the girls and we went up Highway 2 into Tumwater Canyon for a few more shots. This particular image was my last shot of the day, taken in Tumwater Canyon in rapidly fading twilight (it is a 30-second exposure). 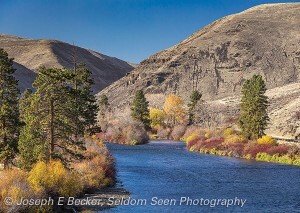 In a late season quest to find more fall color, in November 2014, Tanya and I made a day trip to the Yakima River canyon between Ellensburg and Selah, Washington.We were a bit late, and many of the trees had already shed their leaves. But it was a beautiful (and cold, as I remember,) day, providing blue skies and blue water to contrast with the dry hills and what color was left along the river. This is a very scenic canyon, and a favorite road of mine traverses it. If you are not in a hurry, try skipping the interstate drive between Ellensburg and Yakima and travel the river road, you might be rewarded with views like this one. You can read more about the road on my blog. 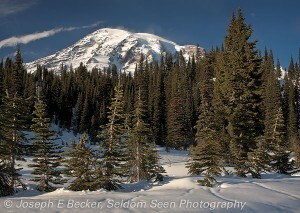 I took this shot on a short snowshoe hike to Barns Flat near Paradise in Mount Rainier National Park in 2011. This is a very popular spot, and it was difficult finding a view without a lot of tracks in the snow. I solved the problem by placing the small trees in the foreground – people had walked around the trees rather than through them. It had been fairly warm for a few days prior to taking this image. This had the disadvantage of melting all the snow off the trees, but did leave interesting patterns in the snow, which I think helped the image. It is hard to believe half of 2015 is over, and we are already at the 4th of July weekend. It has been a good year for Robinson Noble as we have transitioned into our new office in downtown Tacoma. Hopefully you were able to come visit during our open house in May; if not, drop by anytime to say hello. I can’t say I have much Robinson Noble news to report. We did hire two new staff members in the past month or so. We welcome John Anderson to our Woodinville office and Natasha Garland-Clark to our Tacoma office. I will blog more about our new compatriots after I dig out my camera and get some photos of them to share. In my personal news, I haven’t had much chance this spring or early summer to do much photography because I am revising my ebook into a print version. It will be published by Schiffer Publishing and is due to be released next spring. Not to worry, though, I still have plenty of photos to put into next year’s edition of the Robinson Noble calendar! 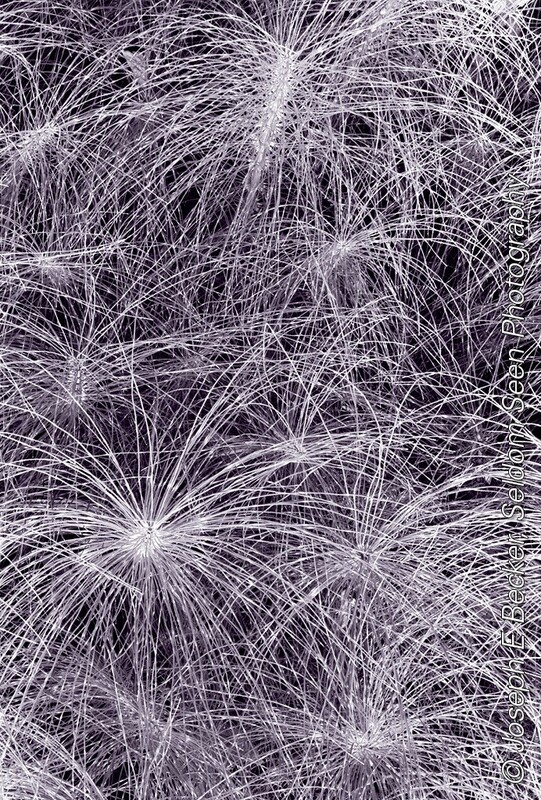 Speaking of photos, the accompanying photograph is the closest thing I have that looks like fireworks. Somehow in all my years of photography, I have not captured any good fireworks shots (I’m not even sure I’ve tried), so this image will have to do. While it looks like fireworks, in reality it is a black and white shot of one of my wife’s chief gardening nemeses – horsetails. (These things grow like weeds in our garden – but then, maybe it is because they are weeds.) Even weeds can have some beauty I guess. Anyway, all of us here at Robinson Noble wish you a happy and safe 4th of July. Take some time to relax with your family and not think about work – there will be enough time for that next week. Robinson Noble’s friends and clients should start receiving the 2015 Robinson Noble calendar in the next few days. If you don’t receive one before the end of the year, send me an email and I’ll see what I can do. As has become my tradition with each new edition of the calendar, I present the back story for each of the photos in the new calendar here in the blog. So if you are one of those people who like to be surprised each month with a new image, read no further! 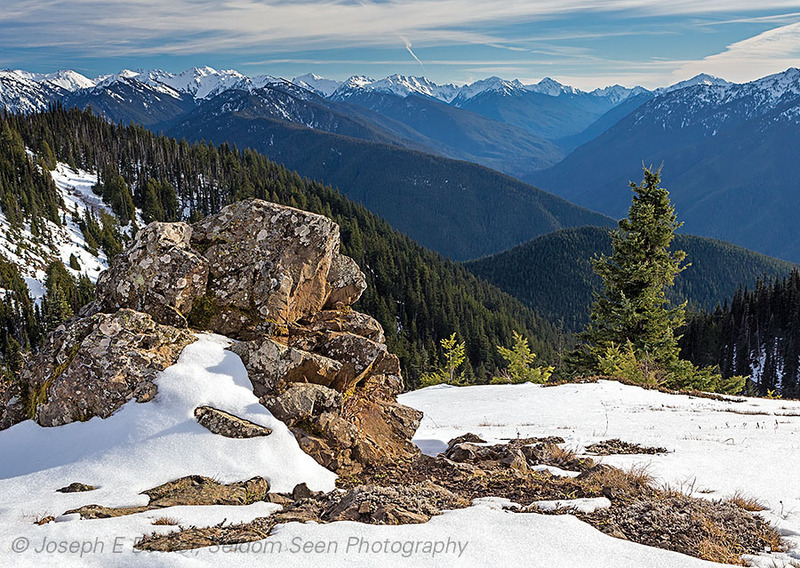 The calendar’s first image is was taken on Hurricane Ridge in Olympic National Park on a day trip Tanya and I made up there in mid-January 2014. Always on the hunt for snow pictures for the December and January calendar entries, I thought a January trip to Hurricane Ridge would be perfect. Unfortunately, last winter there was a definite lack of snow early, and Hurricane Ridge had much less than normal. In this image, you can see bare spots that in a normal year would probably have at least three feet of snow. This image was shot about a mile west of the visitor center. The most memorable part of the trip was that our car died when reached the visitor center. This put a bit of stress on the day’s activities (snowshoeing for me, cross-country skiing for Tanya), not knowing how we would be getting home. But luckily the car started right up when I was finishing taking sunset shots, and luckily so, as the ranger was kicking everyone out of the parking lot for the night. The car, a Saturn Vue, had nearly 200,000 miles on it. When we got home, we took it to the mechanic. To make a long story short, we bought a new car a few weeks later. 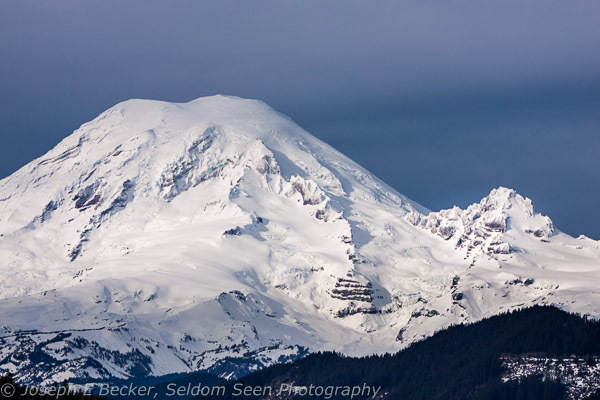 Mount Rainier is one of my favorite subjects. 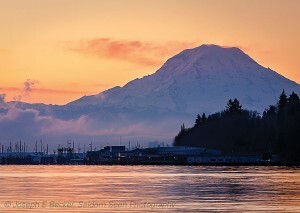 With the mountain being so prominent in Tacoma, it is easy to photograph. I have many pictures of it, so many that I don’t remember the story behind all of them. Such is the case here. I don’t remember my motivation behind this image. It was taken in February 2010 from Owens Beach in Point Defiance Park here in Tacoma. As I think back on it now, I imagine I noticed a nice clear winter morning and headed out to see what I could photograph, and what better than Mount Rainier. 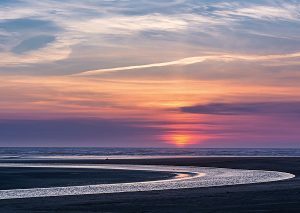 Not being an early riser (a bad habit for a nature photographer), running down to Owens Beach is easy for me. Point Defiance is only about two miles from my house. We had some nice weather last March, and this prompted me take a Friday off and head south to Cape Disappointment State Park with Tanya and our dog Nahla. Cape Disappointment State Park is at the mouth of the Columbia River, and for my money, is one of the more scenic state parks in the state. 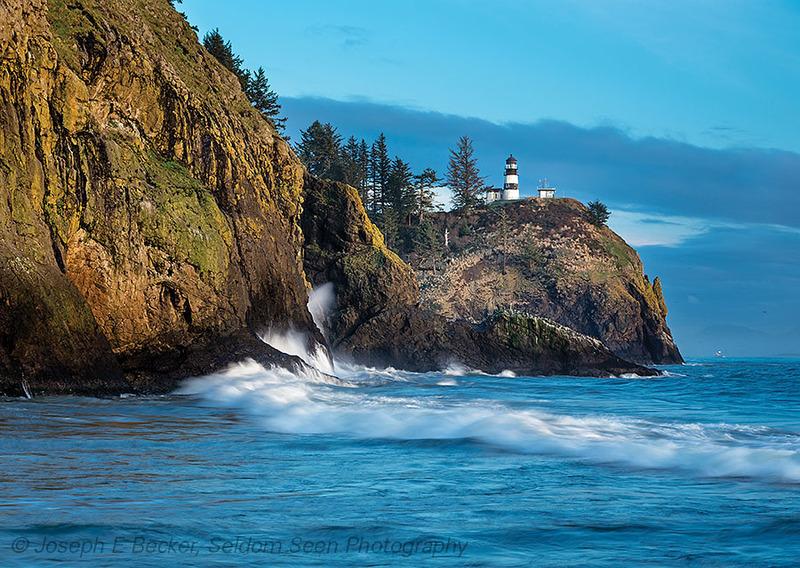 I like photographing lighthouses, and with two lighthouses Cape Disappointment State Park is a premier spot for lighthouse photography. 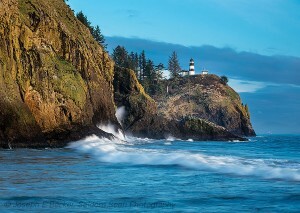 This particular shot is of the Cape Disappointment Light (the other one in the park is the North Head Light). This image was taken from Waikiki Beach. I was hoping for a nice sunset to light up the scene, so we came to Waikiki early in the afternoon to scope it out for later sunset shots. This particular image was shot in that afternoon session. We did go back later in the day, but the sunset fizzled (there was a fog bank off shore blocking the sun). Regardless, I did get some decent shots later as well, but Jim Hay (who is the final picker of calendar images) liked this one better. You can see more shots from that trip on my blog. By the way, if you go down there, be warned that Waikiki Beach and some other sections of the park close at dusk. When those sunset shots turned into blue hour shots last March, a grumpy park ranger ran me and my tripod off of Waikiki. Winter is a great time to photograph at Waikiki, as waves from big winter storms dramatically crash into the rocks below the light house. This is my favorite image of those I took last year. Early last April, Tanya and I took a trip to Spokane to see my parents. We decided to leave a day early to stop at Steamboat Rock State Park to take Nahla on a hike (and take a few photos, of course). It was beautiful sunny weather, but cold. I was hoping for some wildflowers shots, but we were several weeks too early. We did have a good little hike up Northup Canyon, and I took a few nice shots from the shoreline of Banks Lake with the sun setting directly behind Steamboat Rock. We stayed at a motel in Grand Coulee, and I got up early to head back to Banks Lake for sunrise. The sunrise colors, unfortunately, faded quickly, and I was only able to get one shot with any color in the sky. As the sun slowly rose into the clouds, the light became rather dull. But since I was out, I stopped without much enthusiasm at a couple more places along the shoreline. I found a small turnout next to a large rock formation with access to the shoreline. 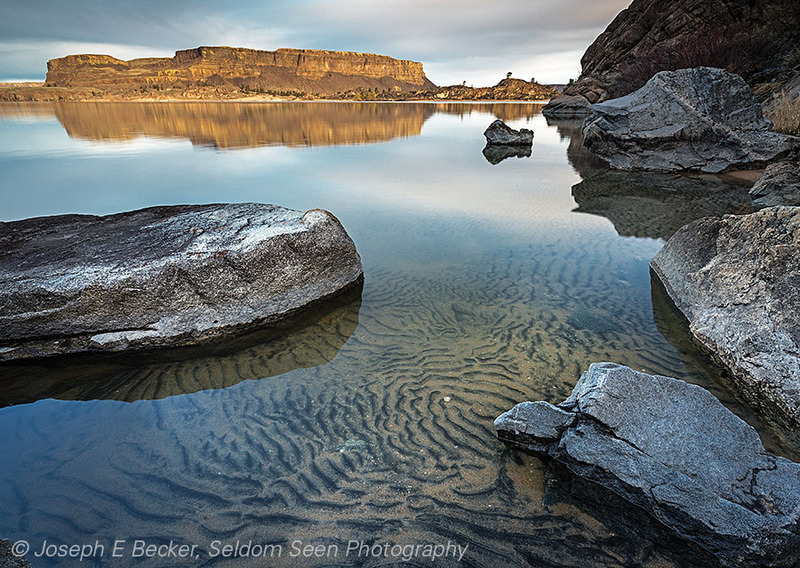 I climbed down over several boulders and was awarded with beautiful ripple patterns on the sandy lake bottom. Then, the sun briefly shone through a thin spot in the clouds right onto Steamboat Rock. The good light lasted about ten minutes, just long enough for me to make my favorite shot of the year. Last Memorial Day weekend, some friends accompanied Tanya and I on a trip to San Juan Island. Though she allowed me to take my camera, Tanya repeatedly warned me that this was not a photo trip. Saturday was rather cloudy with dull light, so it was easy for me to keep the camera stowed. However, late in the afternoon, the sun came out. Mostly cloudy with clearing along the western horizon is prime conditions for a fantastic sunset. Knowing this, I started getting antsy – thinking I could possibly be giving up photographing the sunset of the year! Unfortunately, from Friday Harbor, you cannot see the western horizon, so I had no idea if the ideal conditions were there or not. Finally, I suggested we have an early dinner then drive out to Lime Kiln State Park on the western side of the island, and the group agreed (though Tanya gave the the eye). There was some nice light on the rocks, as seen on the image above, but the fantastic sunset I had imagined did not materialize. But since my camera was out, there was no putting it away, and I also captured a nice black and white image of the Lime Kiln Lighthouse. 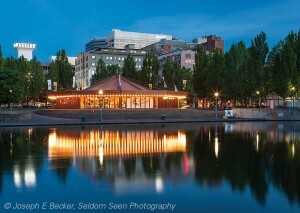 In June 2012 I was hired by American Bungalow magazine to shoot images for an article they were writing about Spokane. The great thing about his assignment was that while they wanted a few shots of bungalows, they also directed me to photograph whatever I wanted in order to show the city using my own unique photographic style. 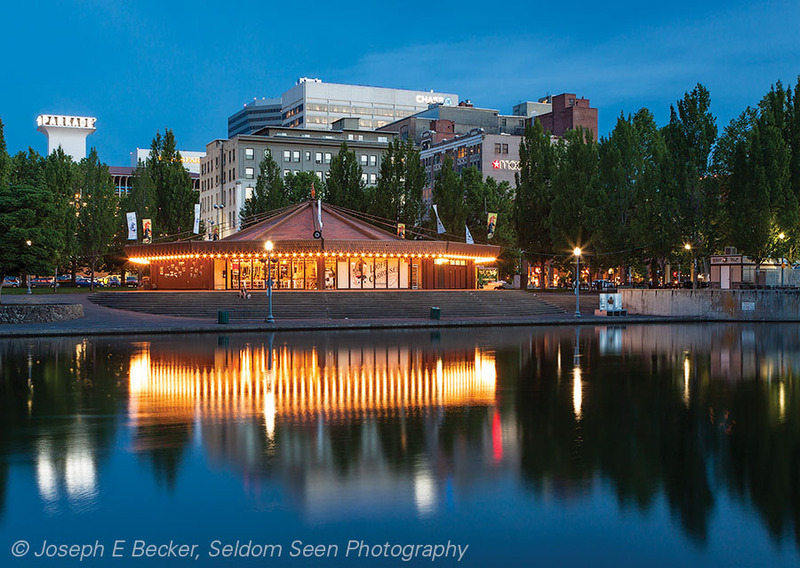 One of the highlights of Spokane is Riverfront Park, so of course I headed down there one evening. Growing up in Spokane, I had always liked the lights of the carousel at Riverfront Park, and I knew I wanted to capture it after sunset. I was just in time too; a few minutes after this shot was taken, the lights were turned off. By the way, while American Bungalow did print 12 of my images for their article, they did not select this one. Last July I took a backpacking trip in Olympic National Park with my brother and his grandson. We did the loop trail through 7 Lakes Basin. This trail is famous for its wildlife, with lots of black bears, mountain goats, and elk. Though all three were reported in the area as we did our trip, we didn’t see any large animals except deer. Thus, I had to focus on landscape photography. Luckily, the 7 Lakes Basin is very scenic. We had warm, cloudless weather most of the trip. In landscape photography, clear blue skies are boring, and therefore, during daytime, landscape photographers always want a few clouds. But come night time, forget it. Give me clear skies because it is time to photograph the Milky Way. 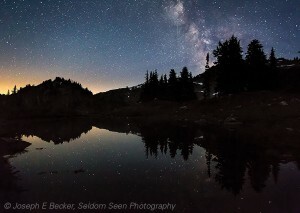 Prior to the trip, when it looked like the weather would be good, I researched where the Milky Way would be in the sky relative to our campsites. Lunch Lake, where we were camping our third night, looked to be a great candidate. As it turned out, there was a small tarn near our tent that I liked the view from better than the lake, and that tarn is the foreground water in this photo. The only problem was that there were two other campsites on the far side of this tarn. In one, there was a group of five or six women camped. I didn’t want to wait too late to take this shot because I wanted a little color in the sky (rather than pure blackness). And as I set up my tripod, I wondered whether I would get the shot or not because the women, whose camp was in the small trees in the center of the photograph, were having (from the sound of it) a very good time. This included repeatedly turning their flashlights on and off (more on than off). I took about five or six shots (each 20 to 30 seconds long), and this is the only one with their flashlights off for the entire exposure. The yellow glow on the horizon, which was not visible to my naked eye, is probably the glow of the Seattle metropolitan area. 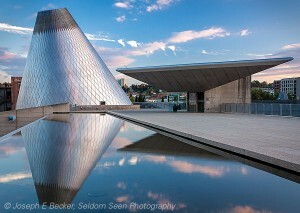 Similar to Mount Rainier, as I explained above for February, the Museum of Glass is a favorite local subject of mine and I don’t always remember my motivation behind each image. This image was taken in August 2012. I have no big story about this image; I think it was just a pleasant summer evening so I went down to the museum to shoot and found nice light on the reflection pond. Now that Robinson Noble’s office is downtown (behind the building on the far right in the photo), I may be shooting even more often at the Museum of Glass. Last year I published an ebook titled Scenic Seattle, the Best Spots – Best Shots Guide to Photographing the Emerald City. 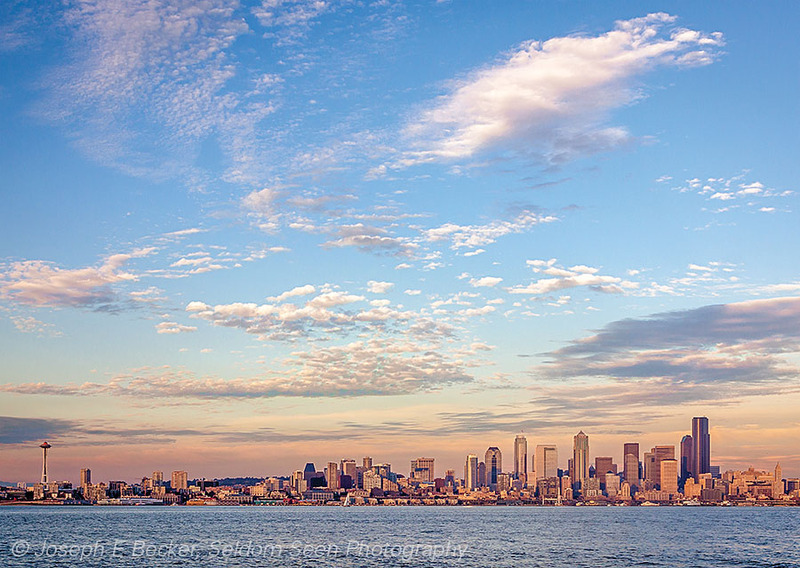 While working on that book, I spent a lot of time photographing in Seattle. This image was taken in September 2012 as part of that work. 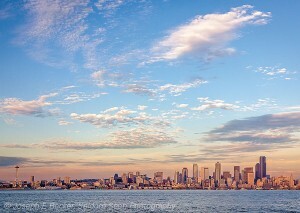 The view is from Seacrest Park in West Seattle, looking over Elliot Bay to the Seattle skyline. The image was taken shortly before sunset, with the setting sun giving a nice warm color to the city. During a period of clear weather in October 2011, I took a day off from work and headed up to Chinook Pass with Tanya. 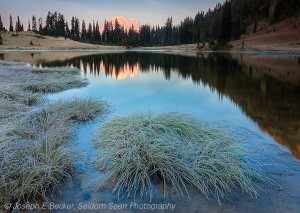 We made an early start so to reach Tipsoo Lake for sunrise. We got there in time, and I set up on the lake shore together with one other photographer. It was a few degrees below freezing, but I remember thinking it was much colder as my fingers seemed to freeze as we waited in the frosty grass for the sun to rise. This image was taken at 7:11 a.m. We ended up spending the day at the pass, taking a hike with the dog to Sheep Lake, then coming back to the Tipsoo area for more photography at sunset. I’ve seen several photos of the Cedar Creek Grist Mill over the years, but always assumed it was in the Rockies or back east. Then, about two years ago, someone at one of the photo clubs I belong to showed a image of it, saying it was in Washington. At that point, I knew I needed to photograph it. Last year in November, I finally got a chance. I took a day off work to go do some photography. 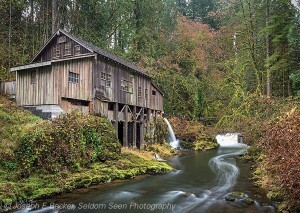 As the day was horribly rainy, I thought about what might photograph well in the rain and remembered the grist mill. So Tanya and I loaded up the car (we were between dogs at the time, so we took the cat with us; I don’t think the cat had a very good time) and headed out. 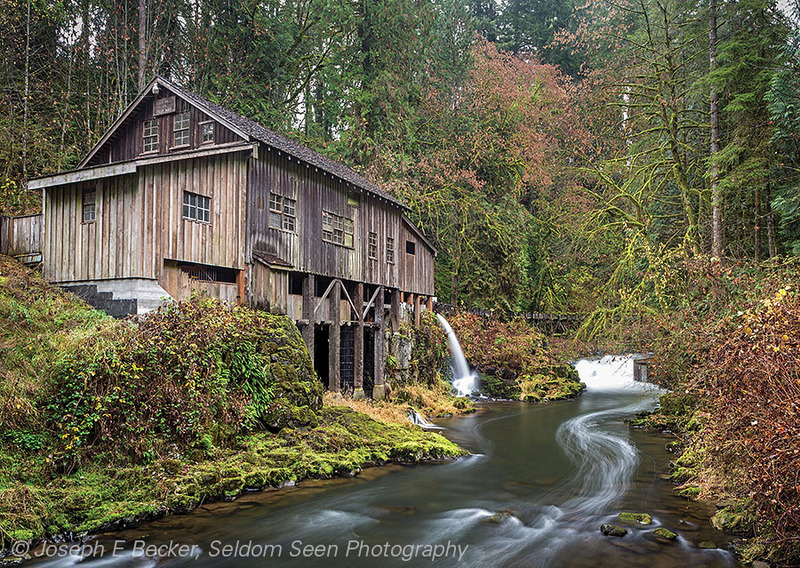 The Cedar Creek Grist Mill is located east of Woodland in the Cascade foothills, and though we went in and out of rain on I5 as we drove south, it was raining steadily once we turned eastward into the hills. Normally the mill is only open on weekends, but we lucked out and it was open for a school group. The kids were leaving just as we arrived, and the grist mill volunteers showed us around after the kids left, even milling some corn for us. After touring the inside and learning the mill’s history, I donned rain gear (for both me and the camera) and took photos of the mill and the scenic covered bridge that crosses Cedar Creek at the mill site. This is the oldest image in the 2015 calendar. 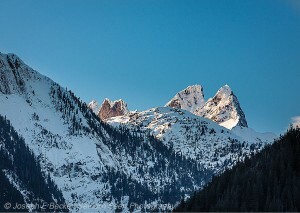 I took it in December 2009 when Tanya and I took a day trip up to the North Cascades. 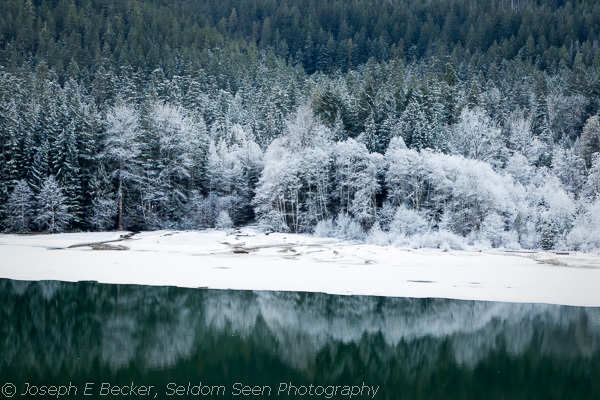 The North Cascade Highway is plowed during winter through Ross Lake National Recreation Area up to the trail access to Ross Dam. It’s a long drive from Tacoma, but this road provides good access into the mountains for winter photography. 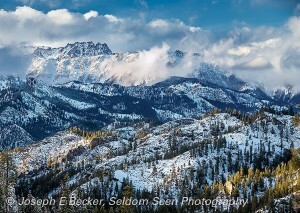 At the time, the snowpack was still relatively light, so I didn’t get the deep winter shots I was looking for. But the weather was clear, so it was a great day to be out on a drive. This image was taken from along the road, just past the bridge over Diablo Lake, using a telephoto lens to draw in the distance mountain tops. Well there you go, the calendar images for 2015. Please leave a comment letting me know what you think! Lately, we have been getting phone calls asking if Robinson Noble is doing the calendar again for 2014. For those of you that normally receive a calendar every year, do not worry. The Robinson Noble calendars are currently being printed and should be in the mail soon. The timing of the calendar production is roughly the same as last year. We had intended to get them out a bit earlier this year, but your humble photographer held up the process. The 2013 Robinson Noble calendars were mailed earlier this month. Hopefully, you received yours by now. If not, we understand that some are still in the process of being delivered. We also have a limited supply left available for purchase (contact me for details). One of the special features of our calendar is that all the photos are supplied by me, who (when away from my job as president of Robinson Noble) am a professional photographer. And as the photographer for the calendar, I often get comments on the images we select for it each year. So I thought I’d tell you a bit more about the photos selected for 2013. News and views from Robinson Noble, Inc., an environmental consulting and engineering firm in Washington State.